SCOUT - Level 1-100. Your mission: reaching level 101. You have a lot of work to do. Your main focus is to get to level to 101 and get promoted! We understand it's a looong and lonely road to 101, because you will see few invites in the calendar until you reach 110 and gear up. Almost everyone has at least one toon which is ready to level up for end-game content, and most calendar invites can only be seen then.. If you're not quite there yet, then consider yourself very much esteemed, for you were invited to the guild because you proved to be a person worthy of being a member of Mythic! Be patient and perservere... Remember to chat with us in Guild chat so we may get to know you and friend you before you raid with us! We count on your participation, teamwork, good nature and spirit of cooperation. Soon enough, you will be all grown up and geared... and raiding with us on end-game adventures! DEFENDER - Level 101. Your mission: Reaching level 110. So... you finally broke down and purchased the LEGION Expansion! This is a rank full of wonders and exploration. New quest lines, new Broken Isles area to explore, new dungeons.... very busy, but very rewarding! It is a slow road to reach 110, as you need to level up and gear up. From Level 98 through Level 110, you will obtain Legion Dungeon gear ranging from 660 all the way up to 805 (all blues!). There will be 10 new dungeons at launch of Legion, including a new version of Violet Hold. This is your best bet at gearing up quickly. Once you hit 110, let me know so you can get promoted! CHAMPION - Level 110. Your mission: Reach item level 825. You made it!!! No more leveling up... now you have to focus on gearing up some more! As soon as you hit 110, you will unlock new World Quests (over 300!!!)... just open your map! World Quests and World Bosses stick around for a week, so you will have ample opportunity to do/kill them (ha!). Emissaries will give you quests each day (finish 4 World Quests associated with the Emissarie's faction) and you will get nice loot from them. You can have upto 3 Emissary quests open at one time. At 810 you can obtain Class Order Hall Set Items (Head and Wrist) by completing quests, which will raise your ilevel considerably. Please let me know when you hit 825 for your promotion! A lot of hard work got you to this level. You finally reap the prize: At 820, you can work on the next Class Order Hall Set Items (Hands and Legs); and as soon as you hit 825, you will be able to join us for Heroic Dungeons for gear items which will help us begin our raiding adventures! Yayy!! Please let me know when you hit 835 for your promotion! At 830, you can work on your next Class Order Hall Set items (Feet andChest). 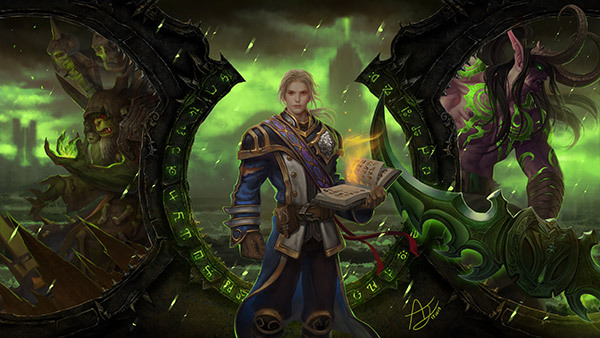 At 835, we can finally use Raid Finder for "The Emerald Nightmare" LFR. Please remember that gear level alone will not get you through all challenges. If you are planning to participate in raids with us, we need you to read our Dungeons & Raids tab thoroughly and to read it frequently, so you are aware of our expectations regarding responding to invites promptly, Gear Score and raid etiquette. We would also like for you to read the Ventrilo tab to be aware of our ventrilo etiquette. It all boils down to common sense and good manners, but we strongly need for you to meet our expectations. Please let me know when you reach 845 for your final promotion before we re-shuffle the ranks once again. I will eventually have to re-shuffle the ranks at some point, because the levels from here on go all the way to 905. To begin this rank, at 840, we can start Mythic Dungeons, followed at 845 by "The Nighthold" LFR. At 850, we can finally start the Normal "The Emerald Nightmare" Raids. Somehow, 860 is either the gear that's listed as drops from "World Bosses" or the level for the bosses themselves... At 865 ilevel you will have reached the item level required to participate in Heroic "The Emerald Nightmare" Raids. Finally, at 875 we can venture in for Normal "The Nighthold". There are still 4 more ilevel markers left: 880 for Mythic "The Emerald Dream", 890 for Heroic "The Nighthold", 895 just marks the highest level for Legendary Weapons and 905 for Mythic "The Nighthold". You will be actively invited and/or rotated to our all of our end game raids. A couple of you might be asked to be Raid Leaders and assist Officers in leading dungeon runs and raids to help out with the smooth functioning of the Guild. These are Warlords who have decided to raid and who have been assigned to the current two teams run by Decapitation and Felstryke. These teams are progressing through the Emerald Nightmare and other raids in Normal, Heroic, and later on, Mythic. Please let Decapitation know if you're interested in raiding so you can be evaluated and placed in one of the teams, according to your class and spec. HIGH GUARD - Advisors to the GM. Please refer to the "Meet the Officers" tab.